Noh is one of the most ancient performing arts successfully developed since the Muromachi period (approximately from 1336 to 1573). 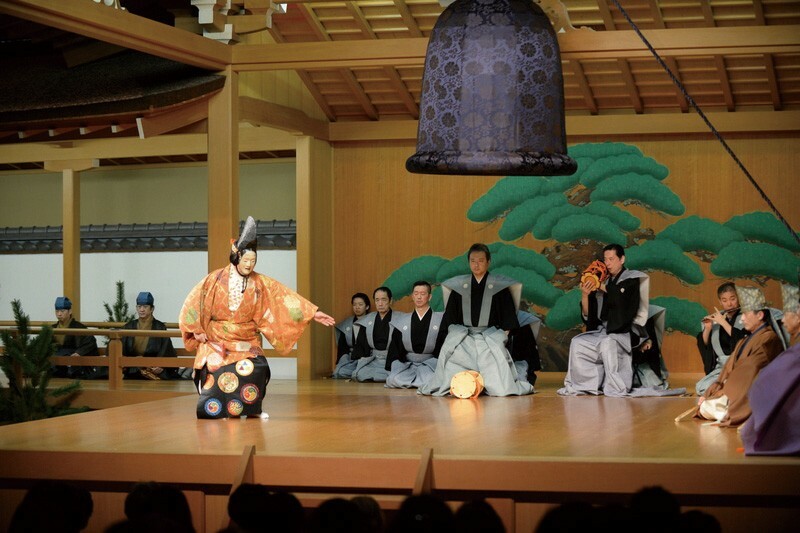 Over the past 600 years, Noh and Kyogen were performed on a traditional stage, which tells the story of Japanese’ minds. 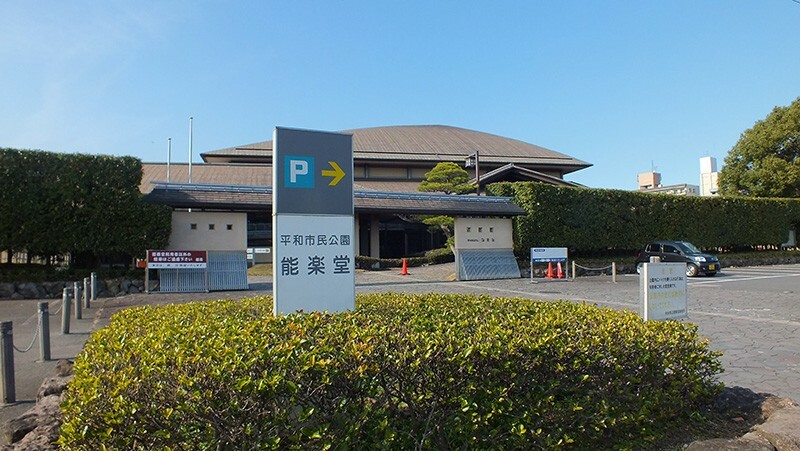 Heiwa Shimin Koen(Park) Noh Theater has been open since 1990, which is one of the most ancient theaters throughout Japan, and is well-known for its main focus as classical theater. Recent years, through the implementation of music concerts and lectures, new encounters and emotions are leading toward a bright future. Moreover, the elegance throughout the four seasons can be thoroughly enjoyed thanks to a Japanese style of garden nearby, having its pond, artificial hill and waterfall. 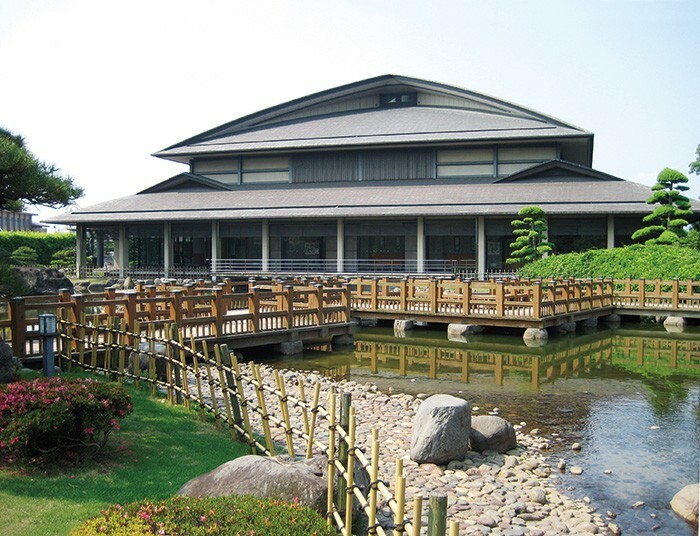 All around Japan, Heiwa Shinmin Koen Noh Theater’s stage is foremost the strongest style of stage has been being used for more than 200 years until now. 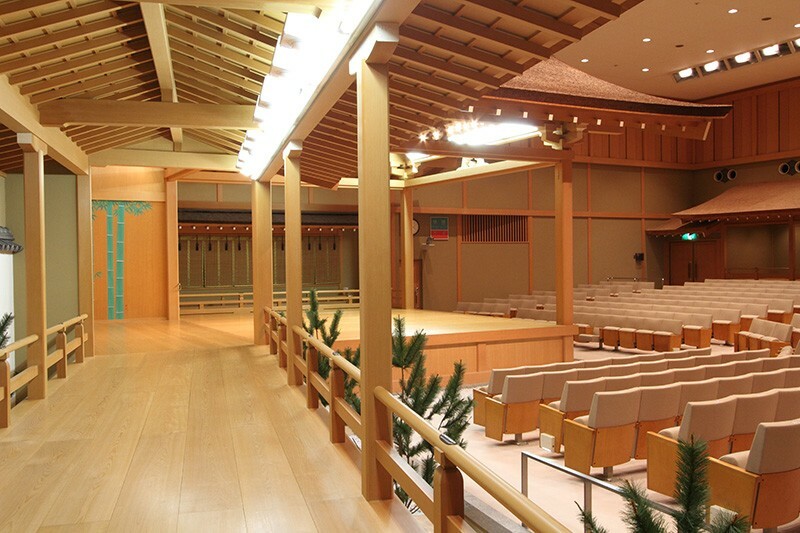 The specialty of this stage is a bridge connecting the mainstage and the backstage, whose floor is made of the Hinoki Japanese cypress. The main stage is made of 17 floorboards, which has a 3cm of inclination toward the front of the stage. 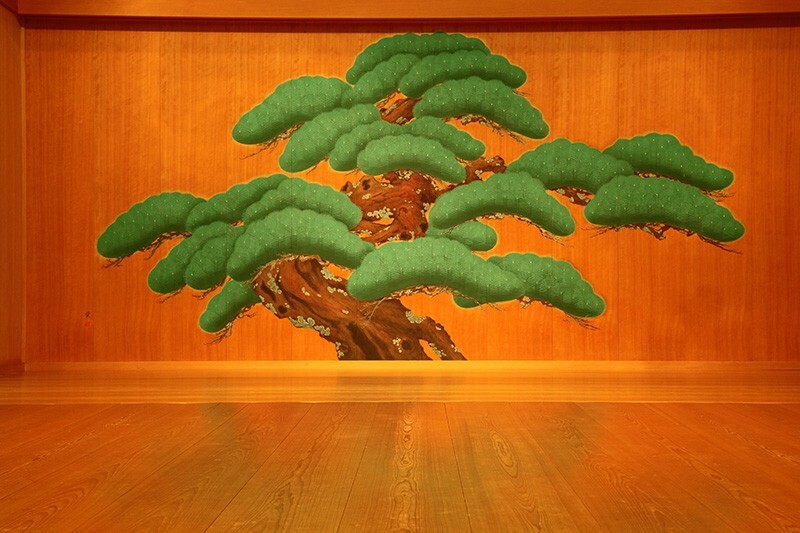 The significance about Noh stage is its floorboards are usually carefully swept, in order to show the uniqueness of the Hinoki cypress. Additionally, there are many earthenware pots are placed under the stage’s floor, even though they cannot be seen from the outside. Each pot has different size and depth of hollow for reverberating the sound. This system was made to produce the best sound every time performers step on the stage, and every time the Noh chorus plays. en Noh Theater. Taking a look from the lobby of the theater, you can enjoy the pleasant taste through the four seasons. Making the best advantage of the view where you can see the changes in seasons, we are pleased to present to you the ‘Sakura tea ceremony’ in the spring, and the ‘Moon-viewing festival’ in the fall. In 2015, Heiwa Shimin Koen Noh Theater was awarded for the prize of Landscape Model in the ‘Oita City 100 Beauty’ selection project. 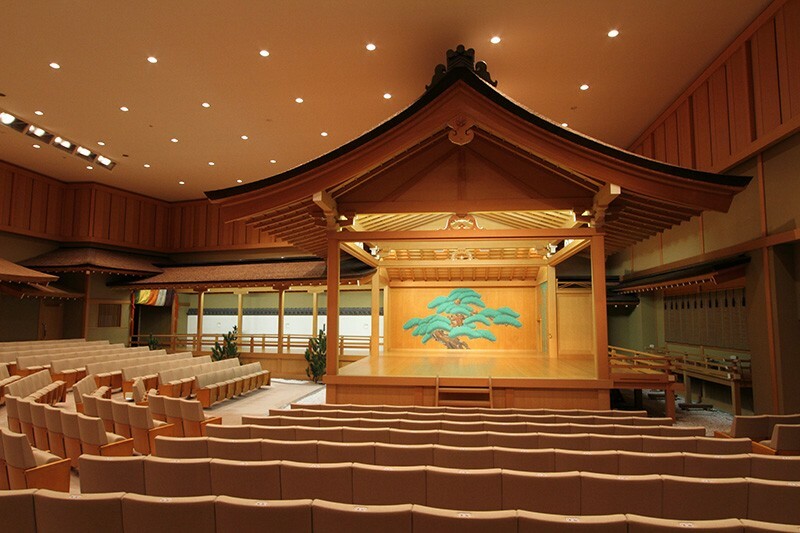 The Noh stage of Heiwa Shimin Koen Noh Theater is one of the unique stages in Japan, because it is possible to remove the downstage right pillar, which is used as a positioning guidepost for performers. 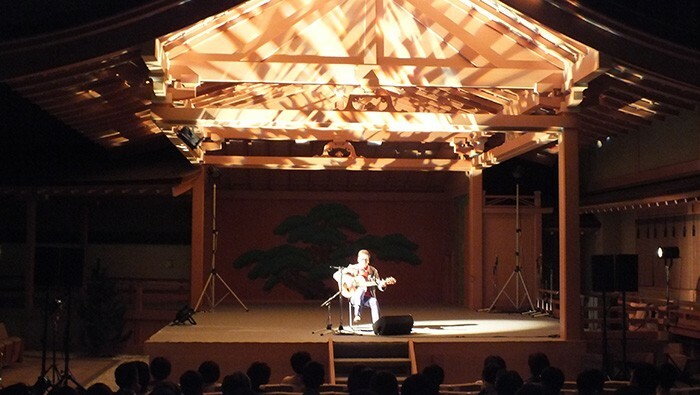 Besides Noh plays, a variety of genres such as folk songs or music concerts are also performed. Not only coming for folk songs or Shakuhachi performances – a kind of end-blow fippleless bamboo flute as classic musical performance, people in Oita prefecture also love to use the area as a place where announcement of cultural activities are held. 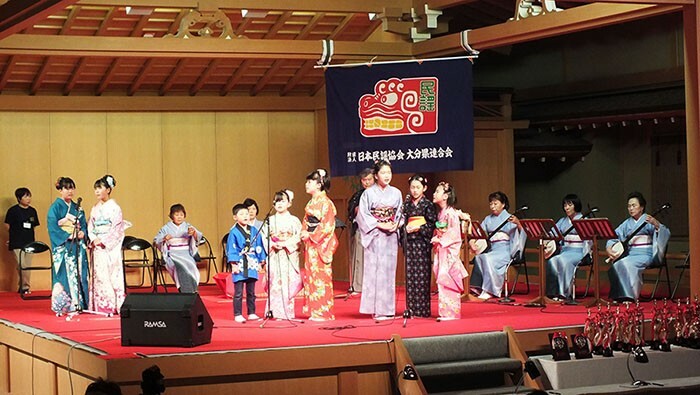 Performers wearing beautiful Japanese traditional Kimono on stage to perform classical arts such as Koto – a thirteen-string Japanese zither, Shamisen – a three-stringed Japanese lute, Shigin – reciting Chinese fine poems, folk songs, dance,… in many years now. Taking the advantage of the sound effect, people can enjoy the calm and relaxed atmosphere of fine live classical performances, such as Jass and Bossa Nova. 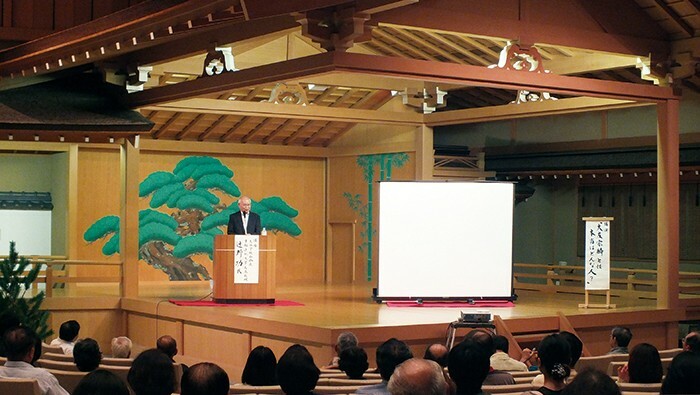 In front of the background of an old pine tree drawn behind, people can also come to live in the solemn atmosphere of various ceremonies, such as lectures and symposia. 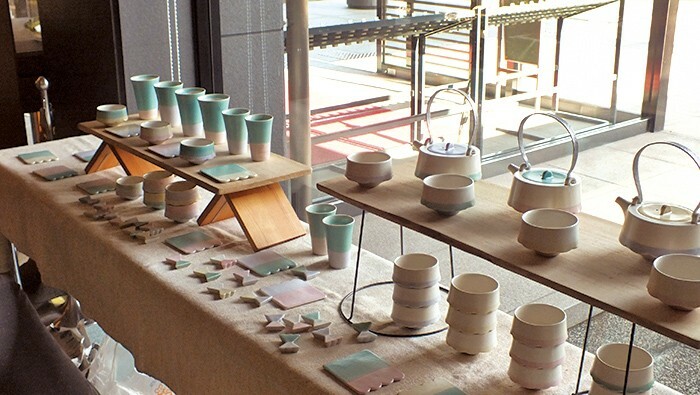 In the lobby where you can not only enjoy the peacefulness of the garden, but you can also take part in plenty of workshops and exhibitions, such as photo exhibition and pottery exhibition. There are cases when we cannot accept visiting to the Noh stage. Please contact us for more information. Please contact us in advance regarding date and time of your field trip. 5-minute walk from Hanazuru bus stop (花津留). 3-minute walk from Geijutsukaikan-iriguchi bus stop (芸術会館入口). 2-minute walk from Maki bus stop (牧). 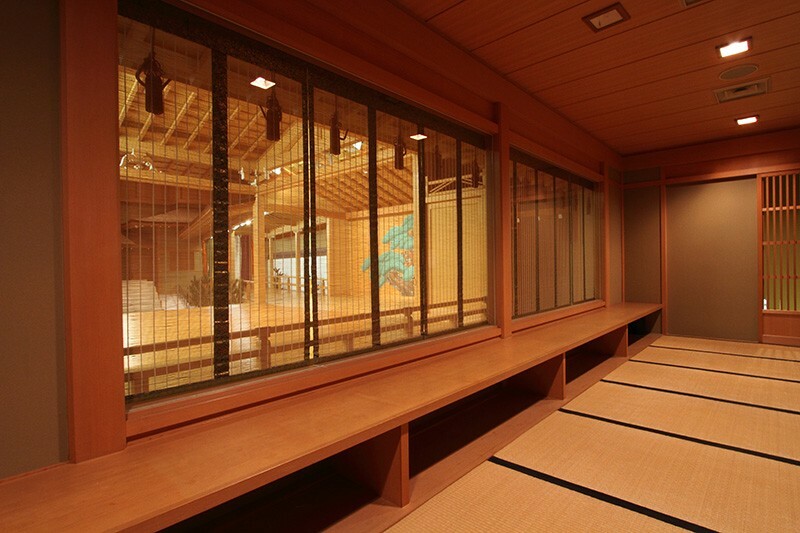 “Nohgaku salon” organizes workshops through lectures regarding Noh. What shouldyou do if you are interested in Noh, yet have not ever watched one Noh play and really want to see one? For those who have the same thinking, we are pleased to introduce you lectures regarding the use of Noh masks and costumes on Noh stage in an easy way to understand. At the same time, we will also ask you to visit the dressing room, gain personal experiences from on-stage performances, and many more. 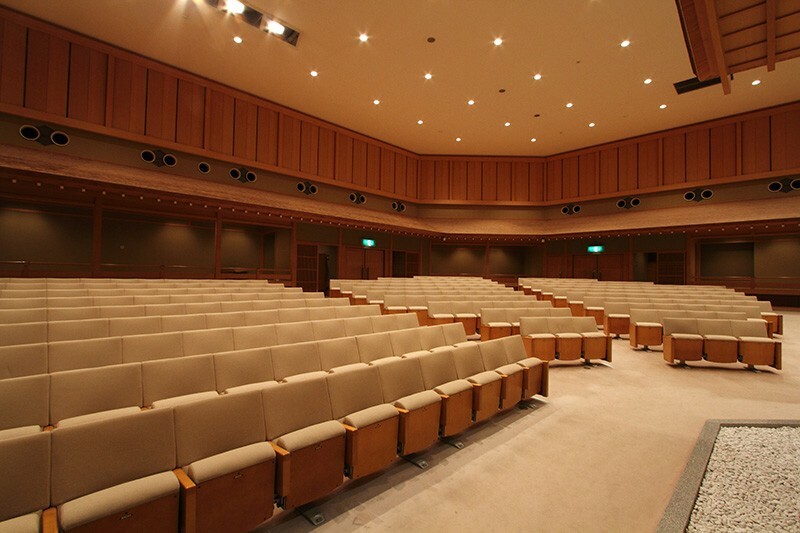 Moreover, inside the theater, you can join with Noh lecturers through tea ceremony, while enjoy listening to folk songs at the same time. ‘Nohgakudo Ars schola’ is one of the initiatives of Heiwa Shimin Park Noh Theater. Ars Scholar selects the best in all sorts of performances, music, and fine arts to all visitors. The word ‘Ars’ is from the Latin word means ‘arts, fine arts, technique, talent, the natural arrangement and capability’. While ‘Schola’ also originated from a Latin word meant ‘school’. ‘Festival of Noh’ is the largest Noh performance we play throughout the year as a present to visitors. By inviting the top class of Noh instructors in Japan, everyone gather around in Oita to enjoy Noh as the wonderful ‘Hidden beauty of the world’. ‘Okeiko Salon’ is workshops organized by Heiwa Shimin Park Noh Theater through the thoroughly selection of ‘Japanese’, ‘Oita’, and ‘Kyushu’. By lectures, Japanese we are trying our best to bring in the preciousness in ‘kindness’, ‘modesty’, ‘beauty’ of the four seasons throughout the year. Would you like to rediscover this preciousness with us? In order to bring Japanese traditional culture closer to you, our Noh Theater are pleased to introduce general goods and commodity in the name of ‘Noh Theater Original Goods’.